Turn a 2.5" SATA Hard Drive or Solid State Drive into a UASP supported USB 3.0 External Hard Drive. 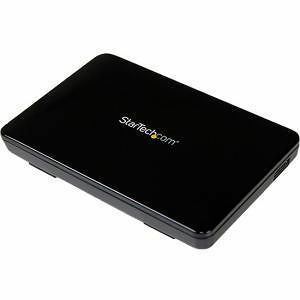 The S2510BPU33 USB 3.0 Hard Drive Enclosure with UASP lets you connect a 2.5in SATA III hard drive (HDD) or solid state drive (SSD) through an available USB port. The enclosure delivers optimal performance with a USB 3.0 connection, but is backward compatible with USB 2.0/1.1 host connections as well. With support for SATA I/II/III, and large capacity drives (tested up to 1TB) this HDD enclosure is compatible with virtually any 2.5in SATA hard drive, and greatly increases the storage/backup capabilities of your computer. For added portability the USB 3.0/SATA III enclosure features tool-less HDD installation, and requires no external power adapter. To ensure compatibility with your computer system, the S2510BPU33 supports all of the leading operating systems, including: Microsoft Windows® (8/7/Vista/XP/Server 2008/Server 2003), Apple® OSX (10.9/10.8/10.7/10.6), Linux, and Google Chrome OS™.